Hey, guys! Hope you have had a great week. Mine has been pretty out of control and exhausting, to tell you the truth. Thomas has been quite the handful and not his usual self. He has been crying/teething everyday since Margaret, my mother in law, left last weekend. On top of that, Adam has been away for the past two weeks (again) for work, so this 24/7 Mum job is really getting to me. Luckily, Daddy-o was making his way home as I wrote up this post, so perhaps I will be able to take a little breather soon. I’m just feeling so worn out and craving some comforting food. 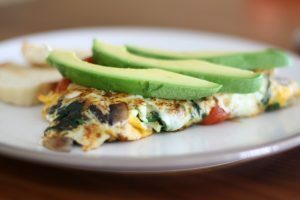 It’s sometimes hard (for me, at least) to keep things healthy when you’re feeling out of sorts, but I decided to whip up my go-to omelette. I make this weekly, usually as a lunch or post workout meal, and it seriously fits the bill. I used to be the world’s worst omelette maker. Quesadillas were a close second. However, since I love both of these meals so much, over time I’ve learned to improve my spatula skills. I am happy to say that my scrambled eggs are no longer a result of an omelette creation gone bad. 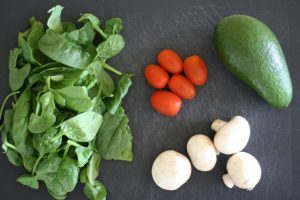 I thought I’d share my go-to vegetarian omelette “recipe”. Seems funny to call it a recipe, though. I’ve been making it the same way for years and up until this blog post, never really thought about specifics. Yet if my instructions help just one person fix their omelette woes, than I will be content. Jumbo spatch gets the job done! 1. 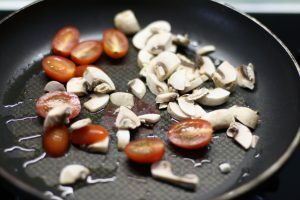 Add butter, ghee, or oil to a skillet over low heat, and add in mushrooms and tomatoes. 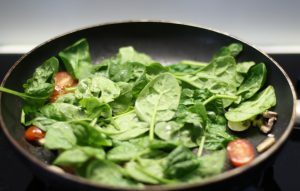 Grill for a few minutes before adding baby spinach. 2. 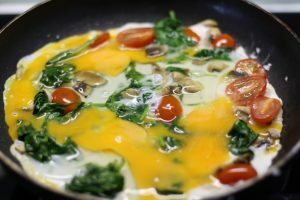 Break three eggs, including the yolks, and allow to spread evenly throughout skillet. Essential step: slide spatula under the edges of the omelette and lift skillet onto a 45˚ angle. 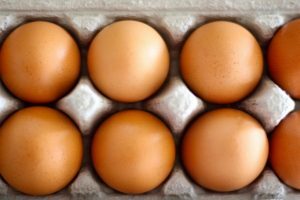 This ensures the egg runs down to fill gaps and cook evenly. 3. 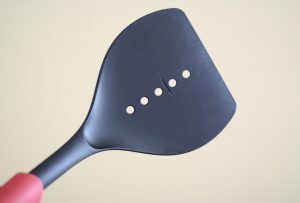 Once underside is cooked thoroughly and top side doesn’t run anymore, take your jumbo spatula and flip!4. 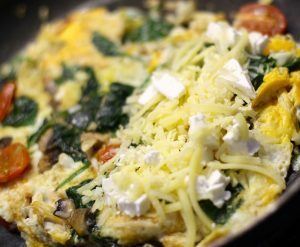 Add cheese to one half of the omelette. 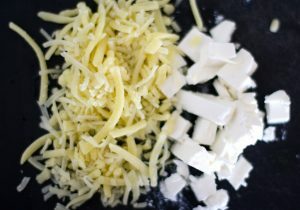 Try to control your cheese portion. 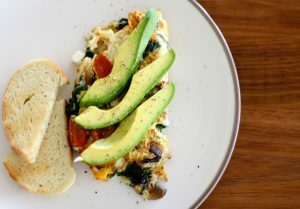 In an omelette, less is (usually) more. 6. Flip one more time for good measure.7. Top with slices of avocado and ground pepper. Pairs well with a slice of sourdough! And there you have it. 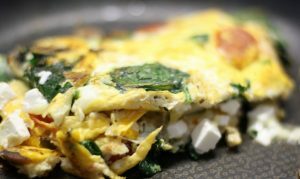 7 steps to omelette success. Might have to whip one up again this weekend. I ended up giving this one to Adam about 10 minutes after he walked in the door today.Well, the weekend is here! I was up early today for a Body Attack class, and have my certification filming first thing in the morning. Eeek! I’m actually sick with nervousness right now. I’m normally fairly composed when it comes to presenting or teaching anything, but when you’re being evaluated, it really changes the game. Say a prayer for me!